Multi grooming kit MGK3020, 6-in-1 trimmer, 5 attachments. 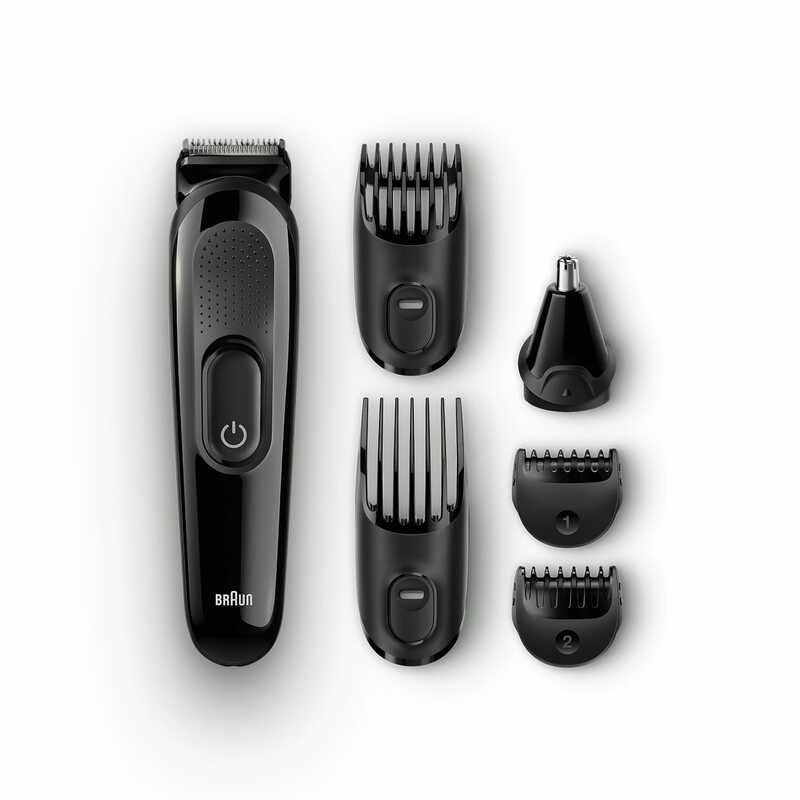 The Braun multi grooming kit offers face and head trimming in one package. Thanks to its clever attachments, perform 6 different jobs effortlessly. Two fixed combs provide 13 precision length settings in 2mm steps to achieve a precise look time after time. The precision trimmer and free Gillette Flexball allow you to create clean edges and curves for an individual look. Remove ear and nose hair effectively without pulling and tugging. The Braun multi grooming kit automatically adapts to any voltage between 100V and 240V. It works in practically every country on this planet. Handy and compact shaver for my designer short stubble. Just want I require. One charge lasts me a full week. (Unfortunately my dog chewed part of the nose and ear trimmer and I am looking for a replacement). Amazing trimmer! Exactly was I was looking for! I was quite sceptical about this product when I opened it. I was wrong! This trimmer is so amazing! I am quite a lazy guy to take care of my beard, but with this Braun trimmer it is so much easier and far more entertaining. I like it because it is precise and most importantly cordless. Not to mention the sharp blades which is cutting like hot knife through butter. I can only recommend it! Cut extremely well and without pulling. Smooth across the face. Lots of attachments. Lightweight means it doesn't tire your hands. But also because of the light weight, the vibration becomes uncomfortable after a while. Right now, I'm only using this with a 2 for an all around scruffy beard look from a full beard. I got this free as a review item last year.